Foreigner belongs to these US bands who definitely made the 70's like Cheap Trick, Reo Speedwagon, Boston or Journey sound better. 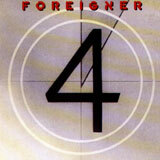 Foreigner's Number 4 is from far their biggest smash hit. Only the two songs Juke Box Hero and Urgent would have been enough to sell it worldwide. Once more the mega producer Robert John "Mutt" Lange (Def Leppard, Bryan Adams and the big success of AC/DC's Highway To Hell) had a fine nose by choosing to produce this album together with Mick Jones. Over 8 millions sales worldwide is the result of this cooperation. The band was composed by the time by Dennis Elliot (If), Rick Wills (now in Bad Company), Lou Gramm (Rochester, Black Sheep, Lou Gramm, Shadow King) and Mick Jones (Johnny Halliday, Spooky Tooth, Leslie West). Of course the leader is Mick Jones, but Lou Gramm added some great song writting in the band and his voice is just perfect for the band. And on this album both wrote some very good stuff. In fact Juke Box Hero is a great Hard Rock song which belongs with its catchy lyrics to rock history. There are some good rocky songs like Night Life or Luanne. Of course, the big slow Waiting For A Girl Like You is one of Foreigner's big hits. And at last but not at least Urgent with its dance floor ance and saxo solo ambiance belongs to their worldwide hits. The slow songs ending the album are a bit in the shade of the big numbers of 4. Danny told me there was a remastered version ... so just go for this one.